California taco vendors might be in a bad way these days, but here in New Mexico we’re still blessed with roadside vans serving some of the best little tortillas smothered in slow-cooked meats and homemade salsas. Remember, a few weeks back, I told you about hauling off 1,480 pounds of metal collected in our backyard? That weird and wacky recycling center sits on Hwy 47, between Albuquerque and the Isleta Pueblo. It’s a curious drive past junkyards, gravel lots, the graveyards of clunky old cars. Come lunchtime, a fair stretch of 47 simmers in the scents of hot air and roasted corn. Trucks are parked, tables set beneath awnings. Worm your way up to the window and order what you wantâ€”but don’t expect too much. Not in variety, that is. Though the signboards might boast a dozen items, this is an “authentic” sort of dining experience in which the cook has what she has, nothing more, nothing less. Beef? Chicken? Fish? Shrimp? 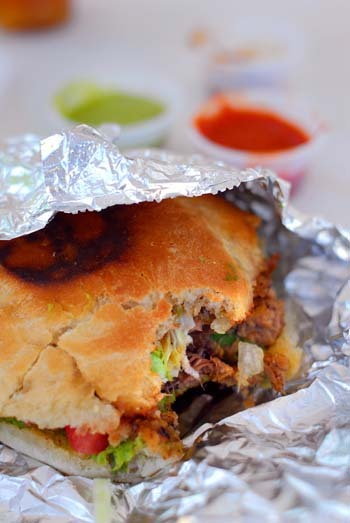 top it with onion, aromatic cilantro, tomato, lime and your choice of salsaâ€”red, roasted red or guacamole greenâ€”and you’ll be stuffing your face just like everyone else who makes this little pit stop on 47. Then sit back, relax, and watch the scene: Southwest airplanes rumbling overhead (airport up the road), and a big truck towing (by rope) a little dead truck with its engine in the bed. They jerk to a halt at an iffy turn. Then slowly, precariously, the two trucks bump their way into the lot across the street where old vehicles go to die. Forever at rest, with a view of tacos and the eternal aroma of pulled pork to keep them company. I just ate but that makes me hungry again. First burgers and now tacos? Nice to see the diet is going to plan! Brock, these tacos do inspire hunger. Miles, that’s why I’m heading out here on a 15-mile mountain bike ride, followed by an afternoon at work in the yard! Biking makes for big appetite…. Oh yumm. Puerco with green, please. Thank god not all California taco trucks are being bullied off the streets. Hopefully it will stay limited, however briefly, to Los Angeles. I can report an impressive number of taco trucks in the East Bay. Can i just testify to the deliciousness that is freshly made tortillas. Oh my good necks…WOW! I’ve never realized how tremendous a flavor and texture contrast there is to mass produced store brand tortillas and that of hand rolled and pressed, griddle/comal cooked tortillas. The taste was night and day. The texture was elastic, supple, and with the perfect bite…that tooth feel was just something to behold. Am i being too dramatic here??? I am talking about tortillas. Huh? But those tacos look fantastic! Talk about synchronicity! I read this post immediately after a lunch of tacos from freshly-ground masa and pork at MY neighborhood taqueria. Or maybe it’s not such a coincidence, I’m now in the habit of eating there three times a week. School is out, and I’ve convinced myself that eating lunch out helps me work more efficiently. Give me warm, homemade tortillas any day! Souavarat, you are not being too dramatic. Now I’m recalling my all-time favorite tacos in a little Mexican village accessible only by boat or horse, where my cousin’s friend served cool hibiscus juice (from her own flowers) and the best beef tacos with the freshest salsa and tortillas she had made minutes earlier…. In a way this is hilarious to me…you guys find the street food every where you go! You are killing me. I’ve been in Afghanistan for two years (the last year without a break). The stuff that they call Mexican in the Army dining facility makes Taco Bell look authentic. But in 8 days I will be back home on vacation in El Paso, and the first thing I’ll going to do is hit Cafe Dos Nidos. It’s a little family run place in a strip mall, with the best salsa I’ve ever tasted. The tomatillas and jalapenos are roasted to perfection, and the texture and flavor are to die for. It will make you pay for the pleasure the next day, though. Small price, in my opinion. Matt, you know how we feel about street food! Glen, I wish you luck on your eight-day wait. A year in Afghanistan without break? You deserve a few grand tacos. I’ll lodge Cafe Dos Nidos in the back of the brain for the next time I pass through El Paso. What are you seeing in Afghanistan these days?